A great headset is key for ensuring you're always getting the best audio experience for your games, and if you're rocking a PC or PS4, the SteelSeries Arctis Pro is definitely one to consider. 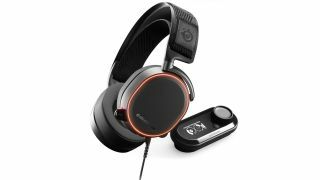 Currys is currently offering the SteelSeries Arctis Pro for £149.99, which is a whopping £100 off the normal price, as part of its Black Friday game deals lineup. It's compatible with PC and PS4, and comes with an amazing GameDAC amplifier that adds stunning 7.1 surround sound both for your PC and your PS4 thanks to the optical audio cable input, which means you're getting high-res audio without the need for a DTS boost. The overall sound quality is incredible, we've tested them ourselves, and you're going to struggle to find any downsides to this stunning headset, even more so at this price. What we particularly love about the Arctis Pro, aside from the incredible sound, is the design. Gaming headsets can be quite garish and bulky, but that's not true of the Arctis Pro. It's elegant, both in terms of the headset and the GameDAC amplifier, with minimalistic touches, retractable mic, discrete RBG lighting and incredible comfort to boot. It's quite the headset. If this doesn't quite float your boat, check out our selection of Black Friday PS4 deals and Black Friday Xbox One deals to see if there's anything else to your liking.